Early last week American Express introduced a new card called ZYNC, a card that aims at young consumers in their 20′s and 30′s who are looking for credit cards that offer flexible rewards program yet don’t cost a lot to own. Since it’s a charge card, not a credit card, the cardholder is required to pay the balance in full every month. As a result, there’s no interest charges like those imposed by card issuers when carrying a balance on the card. While the card can be used like a debit card, cardholders can still use the new ZYNC card to build credit history, one benefit you will not get from using debit cards. But what else does the new ZYNC (what does ZNYC mean anyway?) offer? And why is the card good for young adult? With these questions and the help from Priya Kapoor from Ogilvy Public Relations Worldwide, I was able to get some questions about the ZYNC card answered by Jennie Platt, AMEX Spokesperson from the Zync Team. Hope this interview can give you a better idea about the card and whether it’s the right card for you. 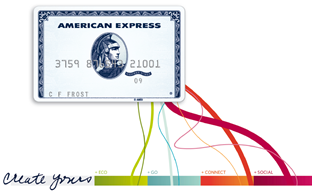 Q: What’s the reason for American Express to introduce the new ZYNC card? A: ZYNC illustrates our ongoing commitment to Charge. It’s also a totally new way to design and launch a product. Because of that, we feel it will appeal to people in their 20’s and 30’s and provide them a great way to get involved with the American Express brand. We wanted to develop product that consumers could help design on the inside, not just the outside. Consumers today want a voice and want to make sure that voice is heard, so with ZYNC we are launching a card that is designed for and by the design target. We are allowing Cardmembers be a part of our design team and collaborate with us to build the future benefits of this card. Q: Which consumer group does ZYNC target? A: ZYNC is specifically designed for adults in their 20’s and 30’s, but will appeal a variety of ages based on their lifestyles. Q: Does the card provide any extra incentive for consumers in their 20′s and 30′s? A: Yes. Cardmembers have the opportunity to create and customize their Card, pick the benefits they want and tell us what else they want in the Card that we don’t yet offer. For example, during Beta, ZYNC Cardmembers can choose from four different groups of benefits we call “Packs,” and only pay for the Packs they want, based on their lifestyles. ZYNC will offer more Packs as the Card launches and evolves. Packs help Cardmembers save money through double bonus points, discounts and/or special offers on some of their favorite and/or frequent expenses, such as travel or going out. Q: How can young adults benefit from using the card? A: ZYNC is a smarter way to pay. It’s a pay-in-full Charge Card, with no interest charges (on credit cards) or overdraft fees (on debit cards). ZYNC gives Cardmembers the online tools and services they need to track and manage their finances. Additionally, using ZYNC helps Cardmembers build a credit history, unlike using debit cards, which is a type of payment this target audience uses a lot without knowing the pitfalls. Q: What are the main benefits of the card? A: ZYNC comes with key features and benefits that Cardmembers expect from American Express such as the award-winning Membership Rewards program, purchase protections and 24/7 customer service. The Card also puts Cardmembers in the financial driver seat since it is a pay in full product and comes with many money management tools and alerts to help consumers take control of their finances and stay out of debt. Additionally, Cardmembers can add Packs, paying only for the Packs they want, to earn extra benefits such as Membership Rewards points and special offers based on their interests. Q: How much does it cost to own the card in fees and interest rate? A: ZYNC has an annual fee of just $25, that’s it, no interest, no hidden fees. For the Packs, some will be free and some will come with a fee. Of the four Packs currently available, the ECO Pack is free while the GO, CONNECT and SOCIAL Packs are just $20 for the year. Cardmembers can add as many or as few as they want. Q: Who is eligible for the ZYNC card? Any requirement on credit history? A: Anyone 20 and older is eligible to apply for ZYNC. For approvals, we look at many different factors, such as credit bureau history and resources such as income, to help make a decision whether to approve an application. Q: Is the card available to everyone now? A: Yes. This is not a closed Beta, if someone wants to sign up for ZYNC they can visit ZYNC from American Express to apply. Q: Finally, what does ZYNC mean? Does the new Card stand for anything?